As a tutor for Classical Conversations, they provide us with 3 days of training (which I’m SO THANKFUL FOR!) Last year during our tutor training, we were encouraged to use a board in class to display each week’s New Grammar. Several of the tutors in my training mentioned that they wrote the New Grammar on their boards the morning of their CC day after arriving on campus. Now, in a perfect world, that sounded dreamy–walking into my classroom, writing all of the new grammar on my board, and peacefully beginning our CC day. However, since I don’t live in a perfect world and would have 3 boys running around my classroom on the morning of our CC day, I decided that writing out the New Grammar right then and there would be…disastrous. 🙂 I had to figure out another option. My next brainstorm was to bring my dry erase board back and forth each week to CC. I would write the New Grammar on my dry erase board before leaving my house (did I mention that my dry erase board was mounted on my school room wall? ), drive to our CC campus and have my CC board all set and ready to go. That sounded doable, right??!!? Well, the more I thought about that option the more I realized it wouldn’t work. I had visions of my board bee-bopping around in the back of my van en route to my CC Campus, and huge chunks of the New Grammar being erased off in transit. Drum roll, please (and cue the “Hallelujah Chorus”). Well, this is where my Tri-fold Dry Erase board enters my life. One of the other tutors in our community shared this link with us. It contained instructions for creating your own Tri-fold Dry Erase Board. After reading over the blog post, it sounded like the Tri-fold Dry Erase Board was the answer to all of my problems! First, all of the supplies could be purchased inexpensively at Lowe’s. There would be some sawing required because Lowe’s can do that for you for FREE! Second, the only “construction” required was done with duct tape. (Don’t you love that!?!?) Finally, the board’s design allows the two sides to fold inward leaving the writing on the board completely covered. Wahoo! Problem solved–I could now write the New Grammar on my board before leaving my house (no dry erase board removal from wall required. Whew! ), have no worries that the words would be erased en route to our CC campus, and no last minute writing on the board in my CC Classroom as my 3 silly monkeys sons run like wild men sit calmly waiting for our CC day to begin. 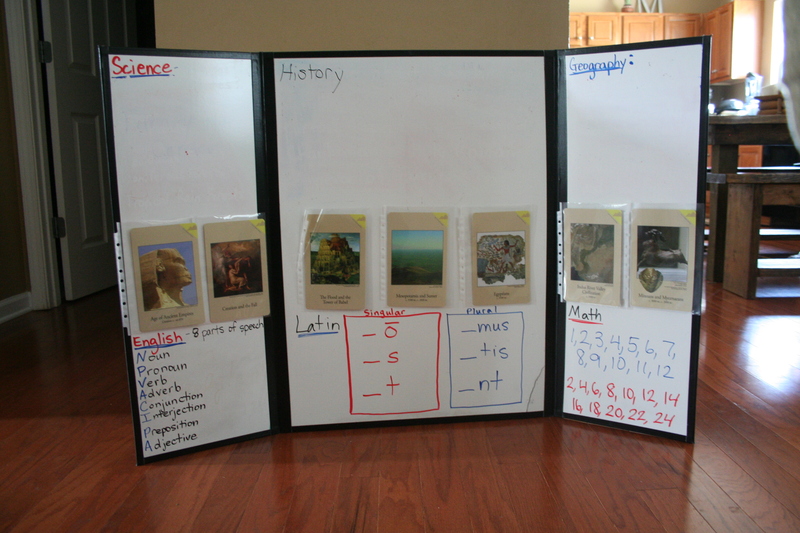 If you’re a CC tutor, CC parent, homeschooling family or dry erase board enthusiast, I highly recommend making this Tri-fold Dry Erase Board. It does not disappoint. Stop by tomorrow as I highlight some of the other creative ways I use this in my CC classroom and at home. The idea of doing the board as dry erase is BRILLIANT. Can’t believe I haven’t thought of/seen that before! This is a great resource…Thanks for sharing…I do have a few questions. Can you tell me how well this has held up for you? Does the dry-erase come off easily? Hi Suzanne! You look familiar…did I see you at the Hendersonville practicum last week? You offered to help me bring my enormous batch of stuff into the building. I shared this with my tutors thinking it might solve many of our morning troubles! Thank you for blogging; I have thoroughly enjoyed your posts for quite some time. Hello, Tricia! Yes, that was me last week @ the Hendersonville Practicum. 🙂 I thoroughly enjoyed it! Thanks for the wisdom and encouragement that you shared! I was especially thankful for your devotions each morning and how you re-centered us on Christ each morning. Praying today for your son’s continued healing. Much love! It was so cool to have you in class, by the way. Thank you for sharing all of your wonderful ideas there… AND here! It was so great to meet you in person and to sit under you in Tutor Training last week! You were EXCELLENT! I appreciated the practical wisdom and encouragement that you offered us–particularly the reminder to keep it simple! This is my mantra for this year! Thank you for your diligence in explaining copyright and its ramifications. That was something that I tried to be proactive and mindful of last year when I started the blog. After the training, I came back and looked at my old posts only to realize some slip ups I had made. Thank you for helping us understand that in greater detail. I also appreciated hearing how CC has impacted your life and your sons (my experience as well with CC. I’m so thankful for that!). You are such a gift to the CC Community at large! Thank you for your help in navigating CC, particularly for beginners. Your blog was invaluable to me when we started last year. Thank you for all that you SHARE, but most of all, thank you for your faithfulness to drive us back to Christ in all things–CC, home, family. It’s beautiful! OF COURSE you can share this on your blog carnival! I’m all about SHARING. ha! 🙂 If anything that I do can be helpful to someone else, I always want it to be used for that reason. 🙂 Blessings to you! Praying for a wonderful school year for you, particularly an uneventful one after last year. 🙂 Much love! Sorry…another question for you Suzanne that I just thought of. How well does the board do with transporting to cc days and not smudging? I had NO trouble with it rubbing off because the two side flaps fold inward and cover the main board. Nothing on the interior is, therefore, exposed. Someone else told me that she put velcro buttons on the top and bottom of the flaps to secure them to the center during transport. I thought that was a great idea, too. However, I never had any trouble with the flaps coming open so not sure if I will get around to doing that. 🙂 hope that helps! One more question regarding hanging your Timeline cards. Did you use tape, glue dots or something else to hold the page protectors to the board? What are your dimensions for your trifold board? I am hoping to use this as a Abecedarian Tutor. Thanks! The 2 flaps on the side are about 12 inches, and the middle section is about 24 inches. I am an Abecedarians tutor, and it has worked perfectly for me! I pray that you have a great year!!! Thanks for sharing your tips. I was the mom who either lugged a HUGE white board complete with heavy wooden frame into class each week or went to the church the night before to write out my board, when it was dark and creepy, or went in early and had 4 kids running around like crazy while trying to concentrate on my board! I will DEFINITELY be making a tri-fold this summer! have you came up with a way to transport it easily, like a carrying case or a carrying bag? I have had several options shared with me after posting this. One mom made a huge “pillow case” out of fabric to use to carry it. I’m assuming she made some kind of strap to carry it the pillow case??? Another lady made carrying straps out of duct tape. I simply carry it from my van to my room (which isn’t that far of a hike). Another mom told me that she used velcro circles in the corners of the “flaps” so that it stayed secure in transit. I am so lost. I need to make these but my measurements aren’t coming out without a large leftover piece. Do you by any chance have a sketch of where to cut the board? eek!!!!!! so sorry! did you get it figured out?!?!? i didn’t have a leftover piece. there were a few women in our community made them and had enough leftover to make a second one out of the piece. maybe that’s it?? ?